You want a ramp to add convenience to your life, and this means helping you with mobility as well as not needing maintenance. Taking a look at your home and where you want to place the ramp can help you make sure you get the most out of it. Here are some things you need to assess before buying and installing your ramp. The ADA recommended slope for public access & walking is a 1:12 ratio or 4.8 degrees. There are some cases where a steeper slope is okay for residential use. Make sure your ratio is comfortable and you don’t have too steep of a slope for walking or for your wheelchair. Your ramp should be about three feet wide. Look at your space and see how much real estate you have to work with. The length of your ramp will be related to the angle of your ramp. If you have a limited amount of space, you will have a steeper angle to your ramp. For this reason, you should decide what you want your angle to be before you look at length. Once you have your angle, look at the height of the top of where you want your ramp to be. From there, some math will help you. For a standard ADA Recommended 1:12 slope ratio, for every inch of rise, you will need one foot of ramp. So if you want the top of your ramp a foot above the ground, this would be 12 inches and require 12 feet of ramp. This can be altered up to a 1:6 ratio if there is a problem with space and you are comfortable with that angle. What do you want your ramp to be made out of? The two main options are wood and metal. Traditionally, ramps were made from wood. 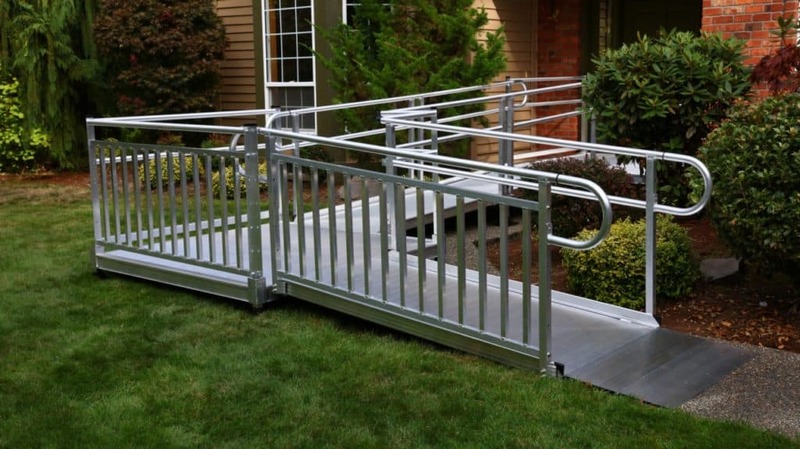 It has become more convenient and cost effective to install an aluminum ramp. Aluminum ramps also hold up better in the weather we see in the Pacific Northwest, where wood requires a lot of maintenance. Weather and environment are huge factors in choosing your materials, so take that into heavy consideration when looking at ramps. If you are looking for a ramp to help improve your mobility, look to Mobility Access Options NW. We are experienced experts in mobility and will be happy to help you with finding your perfect solution to accessibility.